- No info about generating state. Reworked and optimiezed Generating API. Rewrited update function, now game checks for internet connection and for newer version on main menu start. Fixed bug from entering the main menu from generating menu causing game to crash. Sand Physics! Now "chain reaction" works great! Placing Block in Block is now impossible! Deleted some useless stuff etc. Pickaxes with various materilas wood, stone etc. 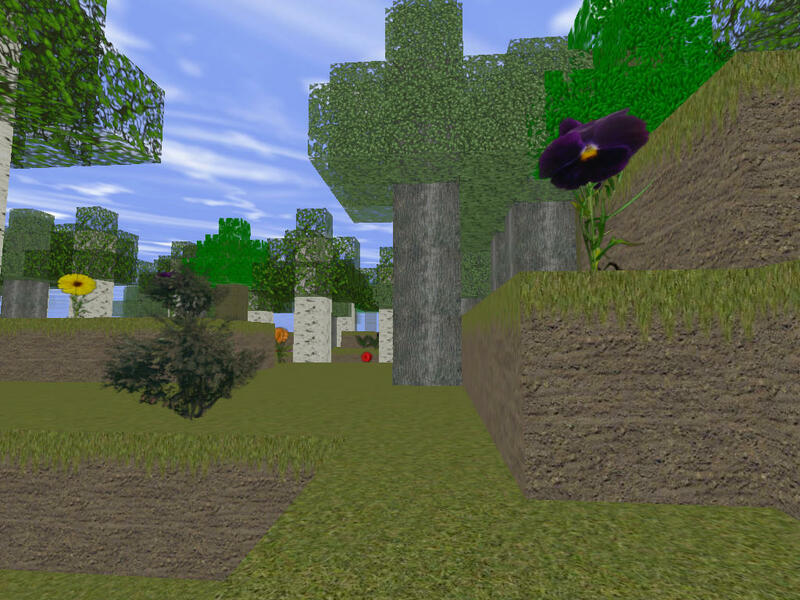 - Mod firstly was named "Minecraft MOD" but later was changed to "Block Stranded" because of permissions. - First Blocks with ID's are: Stone 1, Cobblestone 4, Planks 5, Leaves 17 and Wood 18. They have textures and ID's from Minecraft because of first idea of mod. - Cuted some sounds ex. fire sounds, because if too many torches are placed too close it causing bad sounds. - Blocks and blocks-items use same ID's. Fur Cap,Fur Gloves,Fur Robe,Fur Pants & Fur Boots : does not protect very well but keeps you warm. Iron Fence: to break down takes longer Units and Players get in contact electrical damage. Pig: a friendly mob that loses pork after death and can be tamed. Bear: the bear attacks when he sees a player he loses Fur and Steaks after death. Images are from diffrent in-dev game states! Hmm, looks nice.. I wanted to help, but sorry i never tried to script anything for stranded. I may try later. Thanks My only problem is game lags when generating or when too much blocks is in view. I see. good luck with it..
And BTW will the worlds be infinity? i mean non-ending like minecraft? or just a chosen size? I guess non-ending would be harder to make. well I thought about a mod idea like this myself some years ago but as I already knew the performance issues of s2s I figured it wouldnt work and I feel confirmed now that you report that many lags and situations where the game stucks. in order for this to work properly you'd have to write an extremely high performant script which only generates new cubes when needed and if possible with a little delay so the game wont spawn 2000 blocks at once but e.g. 100 blocks multiple times to prevent it from crashing right at the beginning. at the same time though, dont use timers TOO much as they also slow the game down very fast when used inefficiently. better forget about that again right now. in my experience the alpha command uses way to much time, even if you're using McLeaf's Titanium Mod where this command is fixed. 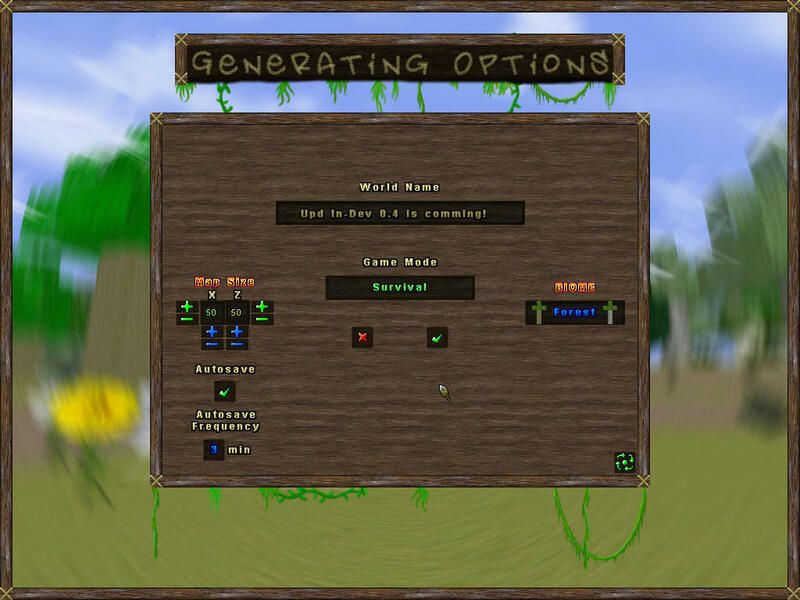 in the original game the command is buggy as it doesnt accept the class- and ID-parameter which the API says it does. it's way easier and efficient to use the definition "autofade" instead. 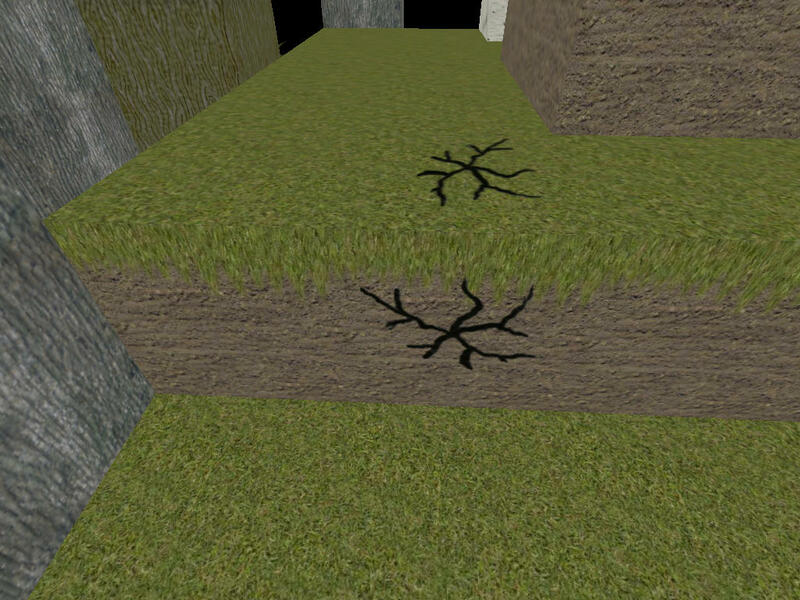 in order to let leaves decay you could use and areal_event when a log is destroyed, triggering an event inside the leafblocks surrounding it. upon this event the leaves use count_inrange to check whether the amount of log-blocks within a certain radius is greater than 0. if that is not the case a timer is started (with a random duration) which triggers another event upon which the leaf block is deleted by free. also from the way you describe it, I interprete that you are also using "air"-blocks for places where no other block is placed? you shouldnt do that - it's way more efficient to calculate the position where a "new" block has to be placed by simply using information such as the player's position, the angles of the camera, the position if the block onto which the new block is to be attached to and such. it's a little more complicated but when done right this could make a huge difference! then if the rendering is your concern, how about splitting each cube into its 6 surfaces? if the algorithm for the terrain generaion is set up right, this could lead to some less polygons which would have to be rendered since 2 blocks that are directly to the side or above/beneath each other would only need 5 sides each instead of 6.
for this you could generate lots of infos (e.g. flags) and arrange them into a x*y*z shape, forming a giant block out of infos (which are invisible of course so they are not rendered, but you can get their positions!). then using loop to run through all these infos you could call an event at each one which then locally checks a local variable which determines the block type as well as the block types of the infos to the 6 sides of it. in case the block type of a neighbor-block is not 0 you create an object of the type of the locally stored number in the center block, facing the respective side. if it is not the case, you dont create such an object since the neighbor-block will cover that "hole" when its other sides are created. later this might lead to very high ID numbers but as far as I recall I already had some IDs around the number 35000 and it wasnt a big problem. note that this means that this number of objects have been created and deleted again over a long period of time, not that I actually had 35000 objects on a map at a single time! shouldnt this rather work the other way around, like you sending (or better posting) the code you already have and I (and other people) can see what you got and give you advice on certain points...? EDIT: If users can, post here you graphic cards and how much you have FPS after load everything in map "test_FLAT v1.1"
Actually I hoped for doomsday so I don't have to do any work anymore... Damn. I don't want to be rude here, but wouldn't it be better to make a mod for Minecraft instead? Yes, but I prefer made something "my"
I tried your Mod and yes, its great for a Mod in development state. Keep it on! Good luck Assassin moder , its an awesome mod.